(Newser) – A SpaceX capsule has returned to the International Space Station, just in time for Christmas. 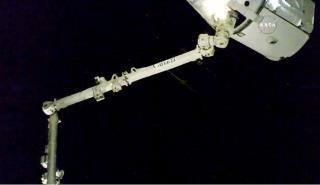 Astronauts used the station's big robot arm to grab the Dragon capsule out of orbit Sunday morning, reports the AP. It's the second visit for the supply ship, which made a delivery for NASA back in 2015 as well. And it's a busy morning in general, notes Space.com, which calls it a "super spaceflight Sunday," as Russia launched a Soyuz rocket early Sunday from Kazakhstan that will carry three new crew members to the ISS. The Soyuz is expected to arrive Tuesday. SpaceX launched the Dragon from Cape Canaveral, Florida, on Friday, using a previously flown Falcon rocket. It was the first time SpaceX had flown a recycled rocket with a recycled capsule on top. SpaceX is looking to drive down launch costs through reusability. The Dragon holds nearly 5,000 pounds of goods, including mice and barley seeds, the latter a Budweiser experiment. The beer maker—eager to serve the first brews on Mars—wants to see how well the 20 barley seeds sprout in weightlessness. As for Christmas presents, NASA isn't saying, in true Santa style. I was hoping the other kind of buds, the spacey kind! "The beer maker [Budweiser]—eager to serve the first brews on Mars—wants to see how well the 20 barley seeds sprout in weightlessness." Your NASA tax dollars at work, citizens. I think it would be interesting to know what REALLY goes on up there.